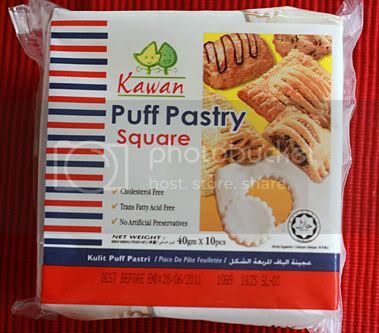 I bought 3 packets of this frozen puff pastry the other day and decided to give it a try today. 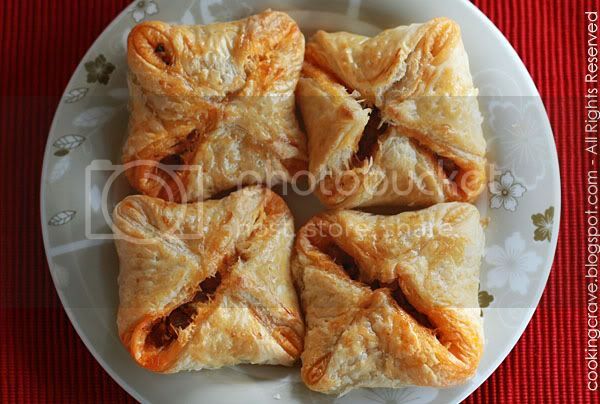 I made this Sardine Puff for teatime snack today. The puff turn out very crispy and flaky. I found it's a bit too oily but overall it's yummy!! 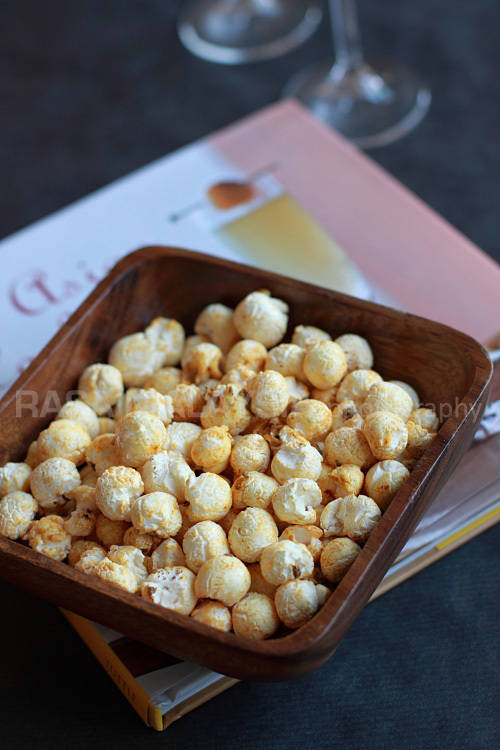 Great to be eaten with a cup of hot coffee on raining day...hehe!! I wrapped the puffs this way for a change, rather than wrapping it in the traditional pillow puff and surprisingly it turn out just great. I love to see how it cracked open on the top and show it's fillings. Heat a pan with oil and saute onion and garlic till fragrant. Add drained sardines in and 3 tbsp of the tomato sauce. Mash coarsely when cook it. Season with chilli powder, salt and pepper. Add lime juice and cook for 1 more minute or till it is dry. Set aside and let it cold. Place some filling in the middle of each square skin (make some holes on the skin with fork) and fold the four edges to the center. Press the edges with our fingers to seal it. Glaze with some beaten egg and bake till puffed and golden in colour. 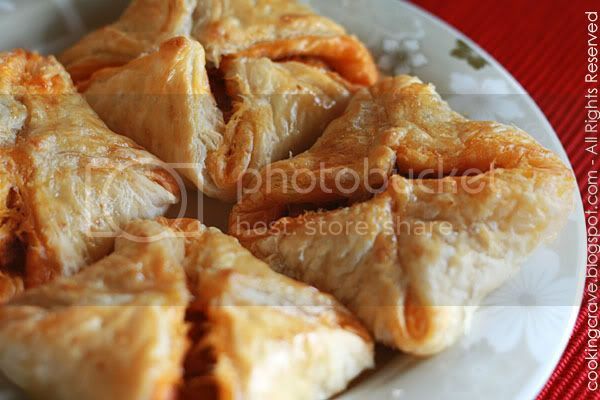 I love making this easy sardin puff too but I used the frozen paratha (roti canai) It is less oily than the puff pastry. ICook4Fun: I will try out the frozen paratha skin next round. Thanks!! 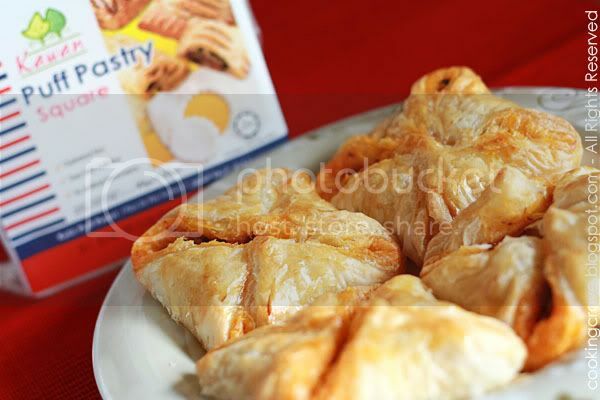 wow..amy, this looks easy..hahaa.. but i think its difficult for me.. i wonder this pastry is sold in Jaya Jusco or not..
Claire: Yes, you can try this...it's easy and yummy. I bought the pastry at Tesco. I also just use the same brand of frozen pastry to make chicken pie, but I think the suggestion by Icook4fun to use frozen paratha would be a good idea for my next trip, since less oily..Anyway, your this puff is simple and delicious..
L like this! I also tried to made sardine roll before.